You know how astronomy works, you look up at something with a telescope and “oh look”, Jupiter has moons or there’s a 7th planet. But you can also find nothing. One of the great things about science is that a null result is still a result. Hence by looking at your measurements carefully enough, you can actually say something interesting about what you haven’t seen. On the 3rd of November 2005 a gamma-ray burst (GRB) was detected in the constellation of Ursa Major. Further examination found that there was a well-known galaxy in the vicinity, M81– Bode’s Galaxy. Could this violent event have come from one of amateur astronomy’s favourite objects? During the latter half of the 20th century, astronomy moved away from being purely based on optical light to a wider range of wavelengths across the electromagnetic spectrum. From radio to submillimetre, infrared, UV, X-ray and gamma-ray, astronomers now have a vast array of tools for studying the visible universe. There are however other sources of information that come from astronomical sources. Gravitational waves were first predicted by Einstein. While they haven’t been directly observed, their emission has been inferred from the orbit of a pair of neutron stars. Gravitational waves subtly stretch and compress spacetime. Hence to detect them you have to very accurately measure stretches and compressions. 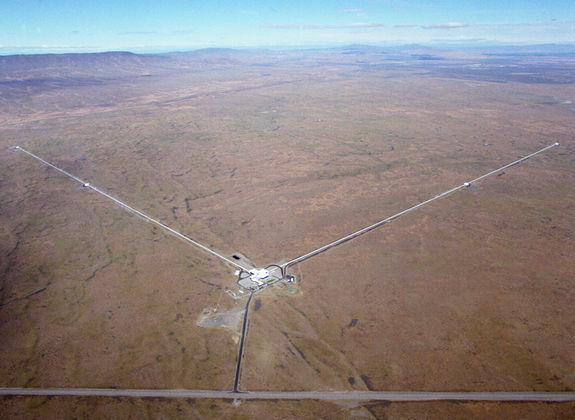 This is done at labs like LIGO where they measure this stretching over long distances (several miles). Such long distances are needed as the effect of gravitational waves is fractional. Hence the bigger the distance over which you measure the stretching, the bigger the stretch. The gamma-ray burst in the vicinity of M81 was what is known as a short duration burst. While long duration bursts are the product of exploding massive stars, most short bursts are though to be formed when two compact objects (neutron stars or black holes) slam together after spiralling in due to energy lost by gravitational wave emission. However there is also another possible cause, a massive flare from a magnetar, a neutron star with an extremely high magnetic field. To investigate this, a team from LIGO searched through their data for a signal that could come from either a magentar or colliding compact objects. They found nothing. But nothing can be interesting. After going back and looking at their measurement errors they were able to set upper limits on the flux of gravitational waves received from this gamma-ray burst. Consequently, by examining the flux they would expect to receive from merging compact objects they were able to set lower limits on the distance this burst was from Earth. Based on these limits they excluded a black hole – neutron star merger in M81 as the source of this GRB to at least 93% confidence. The constraint on a neutron star – neutron star merger was slightly weaker, but would require the event to have a very weakly beamed jet (and GRBs are known to almost always have tight, collimated jets). Based on a fairly generously unbeamed jet the LIGO results (seeing nothing) exclude an black hole – neutron star merger in M81 to greater than 99% confidence and a neutron star – neutron star merger to over 98% confidence. However the expected gravitational wave flux from an erupting magnetar is too low to be detected at the Earth – M81 distance so the results don’t rule that out. So what was the cause of the bright flash of gamma-rays seen in Ursa Major seven years ago? Dunno, but seeing no gravitational wave signals tells us that it’s highly unlikely to be two massive compact objects slamming together in one of the sky’s prettiest galaxies. Last Christmas something exploded in the constellation of Andromeda. Well, that’s not quite true. This gamma-ray burst (named GRB 101225A) went off a long, long time ago, but the resulting flash finally arrived last year and were picked up by the SWIFT satellite (which then probably interrupted several festive lunches with its Burst Alert alarm). 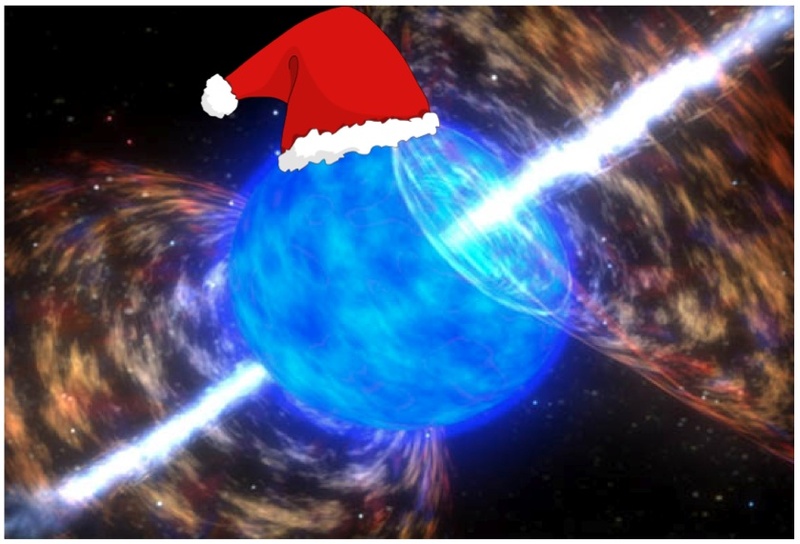 The majority of gamma ray bursts are thought to be massive stellar explosions in distant galaxies, but the Christmas event didn’t fit this picture; the initial burst of gamma rays lasted for an unusually long time and, despite the efforts of powerful optical telescopes, no convincing candidate for the host galaxy could be found. Nearly a year on from the initial observation two groups of astronomers have come up with two different, but equally plausible, explanations for the odd GRB 101225A. The first team suggest that it was caused by something small, like a comet, breaking apart and then falling into a neutron star within our own Milky Way. The alternative theory, put forward by the second team, also involves a neutron star, but in this case it’s merging with a young red giant star in another galaxy. Unless the host of this gamma ray burst is found, and its distance measured, there’s no easy way to choose between these two options. Hopefully deeper optical data with, for example, a telescope like Hubble will provide the answers and settle this debate. True, the white hole said. My name is Khairelikoblepharehglukumeilichephreidosd’enagouni – and at the same time he went flickering through a pattern of colours that was evidently the visual translation. Fred, whilst being in many ways not a typical white hole (he talks for a start, and is surprisingly prone to hiccups), does exhibit their most fundamental property – he continuously emits stuff. A white hole is a region of space and time which can’t be entered, but which gives out material. It’s the opposite of a black hole, we’ve never seen one and there’s a good chance they don’t exist. The possibility that they do arises from the maths of Einstein’s General Relativity. Even if they do, the combination of a strong gravitational pull and the constant stream of new material being emitted means that they’ll probably collapse in on themselves and form a black hole before we could see them. Hang on though, what if they just popped into being for an instant, spewed out a load of stuff at once, and then vanished again? That’s the idea put forward in a paper which came out this week. The authors suggest that if this was the case they could pop up anywhere in the Universe, and we’d see them as brief, intensely bright, objects. This sounds suspiciously like the features of a mysterious type of object called a gamma ray burst. The current best explanation for the majority of gamma ray bursts is the explosion of a massive star. However, there exists a subset of sources which don’t fit this picture, and it is these which might, just might, just possibly be white holes. The chances that any of them are like Fred though are, sadly, small.